Ohhhh, roast chicken, my most favorite of comfort foods. Due to the fact that it is tasty, easy, versatile, and economical, this is a weekly staple in our household. By adjusting the flavors of the brine, what you put in the cavity, and any glaze or rub you choose to make, you can satisfy any sweet, salty, spicy, or other flavor profile craving you may have. While this is my favorite way to make a delicious, moist, flavorful roast chicken, almost any of the ingredients listed below can be changed, with the exception of the water, salt, and sugar content for the brine. The recipe below results in a slightly spicy, slightly sweet chicken with hints of sage and rosemary and the perfect salty-goodness, but use whatever you have on hand to experiment with flavor profiles. 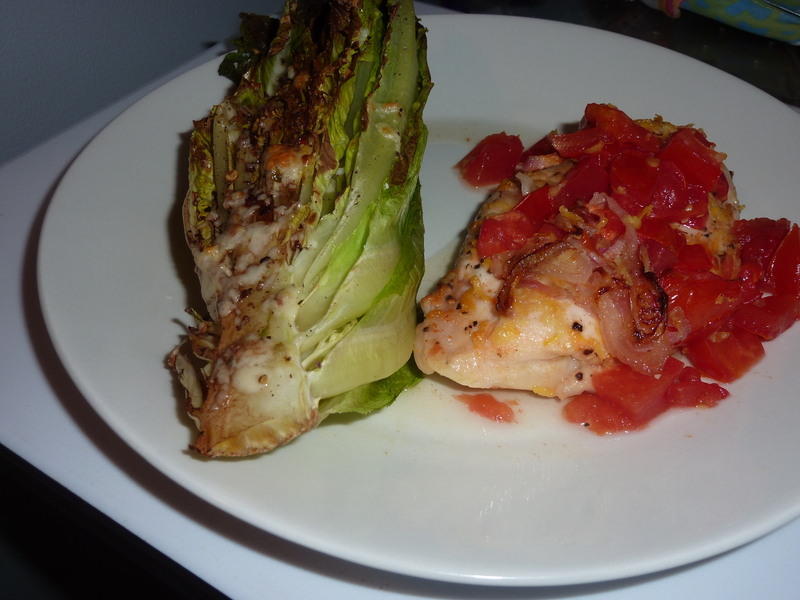 I included the recipe for a quick and simple balsamic glaze, although it is not necessary to a delicious chicken. It happens to be what I added this week, and I wanted to stay true to the picture. I always use a fryer (also known as a broiler) chicken, which simply means that it is a between 7-13 weeks old and weighs between 1 1/2 and 4 lbs. I aim for a bird that’s right around 4 lbs. This is the perfect size for a dinner for the two of us with enough left over for another meal and to make some stock. Personally, I think a brine is the easiest and most effective way to impart outstanding flavor and moistness to the meat of a roasted chicken. It’s a step I almost never do without. If you don’t like salt, you might want to skip the brining step, but a proper salt-to-sugar-to-water balance in combination with the proper brining time, as outlined below, does not result in a salty bird. 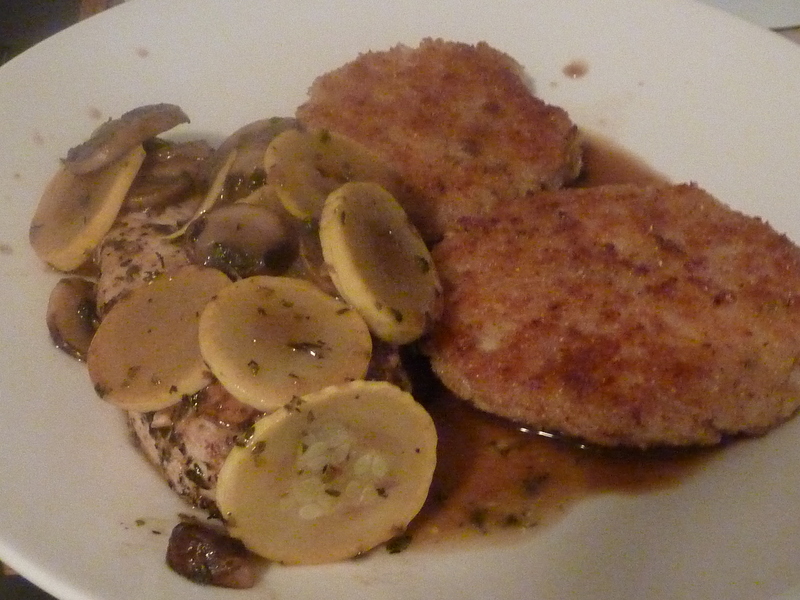 Rather, it draws in the accompanying herbaceous flavors and elevates the natural meaty goodness of the chicken. This step can easily be accomplished before running off to work in the morning. Now, I am not good at math, so I had to roast my fair share of chickens before I could easily calculate brining and roasting times accurately. My general rule of thumb is to leave the chicken in the brining solution about one hour, but certainly no longer than two hours, per pound. Less than that does little to draw in the flavors of the seasoning of the brining solution, and more than that results in an over-salty or mushy-textured chicken. Twenty minutes per pound has been a successful rule of thumb for roasting time over the coarse of my chicken-cooking career, but a meat thermometer is the best way to tell when any meat is truly cooked. I recommend the thigh reach a temperature of 170° or so (the temperature will continue to rise as the chicken rests), while the USDA recommends 180°. Use your judgment. Finally, SAVE YOUR SCRAPS, including giblets, necks, bones, scrap meat, fat, and skin. Leftover chicken carcasses can be thrown in the freezer and used to make the most delicious homemade stock. The box stuff is garbage in comparison to the silky, gelatinous, chemical-free stock that you can make for pennies on the dollar, and very little effort, in your own home. To begin, in a medium or large saucepan heat roughly half of the water necessary for the final brining solution over medium-high heat until it reaches a simmer. A little at a time, add kosher salt and sugar while whisking until dissolved. It may be necessary to add more water to the saucepan in order to dissolve all of the salt and sugar. Once the salt and sugar are dissolved, transfer the water, plus any additional water according the measurements above, to a container large enough to hold the brining solution and chicken. This can be done in a large ziplock bag, though I prefer to use a large stock pot. Rule of Thumb: Chicken should be brined one hour per pound, rounding up to the nearest hour. Remove chicken from refrigerator and place in large casserole dish on top of a roasting rack. Separate the skin from the flesh of the chicken breast using your hand (or a pair of scissors as necessary) and pluck a few rosemary and sage leaves from reserved brining ingredients. Place these under the skin of the chicken as evenly as possible. Season the rest of the chicken with freshly cracked black pepper and crushed red pepper flakes to taste. DO NOT add extra salt during this step, as the salt from the brine will be enough for a perfectly seasoned chicken. Stuff as many limes and herbs reserved from the brining solution as will fit into the cavity of the chicken, discarding any extras. Place chicken in preheated oven on center rack. Roast at 475° for 15 minutes or until skin is light golden brown. Meanwhile, prepare glaze by whisking together ingredients in a small bowl. Brush glaze over entire chicken following “high heat” blast. After 15 minutes, reduce heat to 350°. Roast chicken roughly 20 minutes per pound (rounding up to nearest pound), or until meat thermometer inserted into the thickest part of the chicken’s thigh reads 165°. If chicken becomes overly brown, tent with a piece of tinfoil. Reapply glaze in the last 10 minutes of cooking. 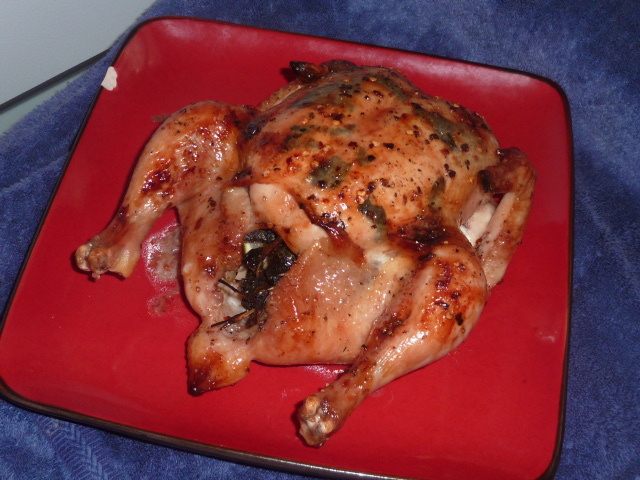 Rule of Thumb: Roast chicken 15 minutes at 475º, and then 20 minutes per pound at 350º. Rest chicken 15-20 minutes.